A cabinet card portrait of a young boy wearing a military uniform and a false moustache. 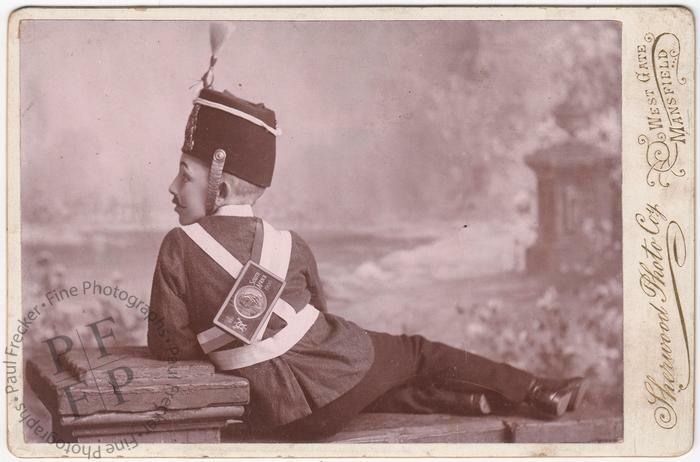 His costume incorporates something, possibly a tin, on his back, relating to South Africa in 1900. At the time that this photograph was taken, Great Britain was fighting the Second Boer War in South Africa. Photographed by the Sherwood Photo Company of Mansfield in Nottinghamshire. Condition: the print presents some small imperfections, including some black flecks in the area of the background and some fine scuffs in the area of the boy’s trousers, but is otherwise in fine condition, with very good tonal range. The mount presents a small amount of edge wear and verso some grubby marks and one abrasion. Dated 1901 verso in pencil in a period hand. Dimensions: the dimensions of a standard cabinet card are approximately 6.5” by 4.3” (16.5 cm by 10.8 cm).